This birthday card came together quickly thanks to the Splitcoast Sketch#455 here. 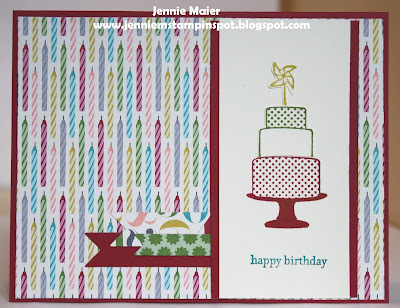 I used the Bring on the Cake stamp set with some Birthday Basics DSP. 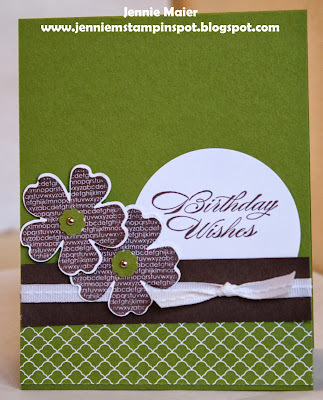 I need more birthday cards so I cased this really cute card here by Dawn Olchefske. 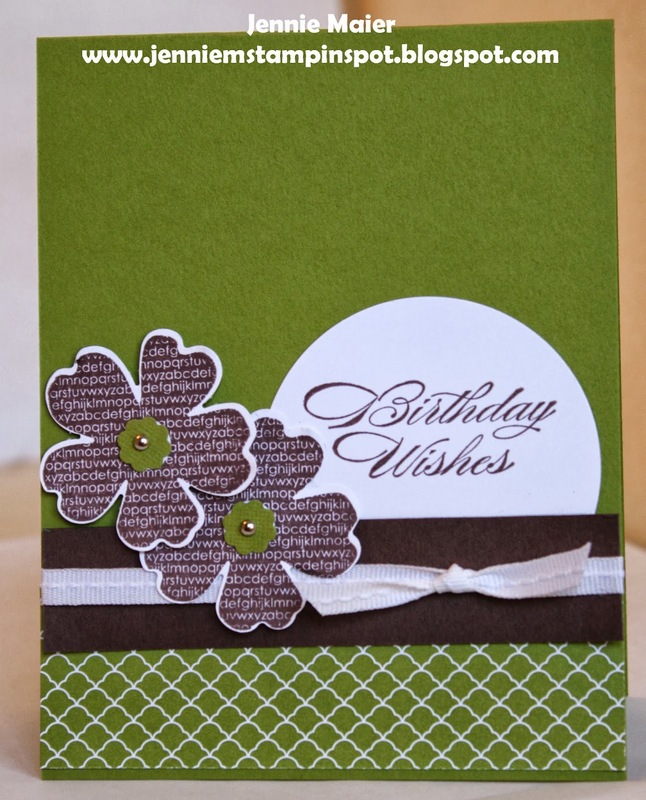 I just changed up the colors and made it a birthday card and used a different flower from the Flower Shop stamp set. 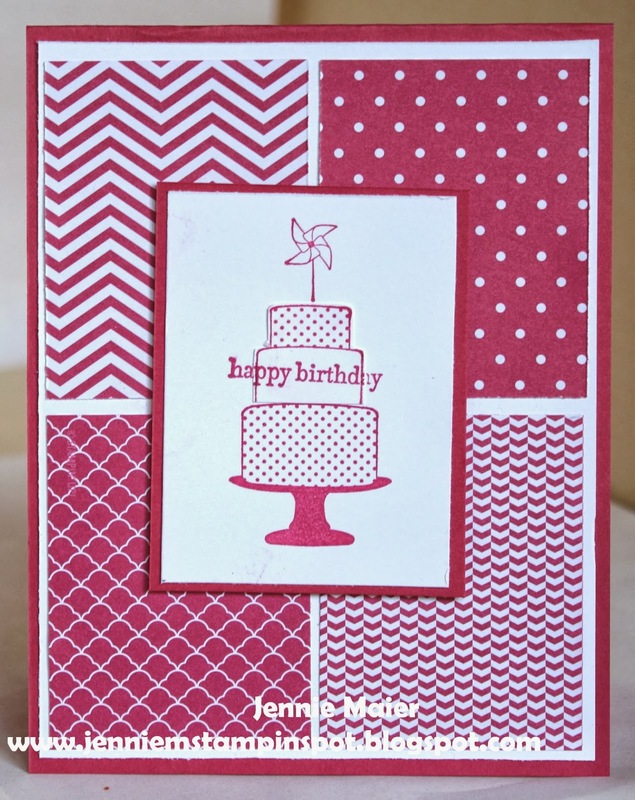 The greeting is from the Bring on the Cake stamp set. And some Old Olive from the Brights Designer Series Paper Stack. This is my monochromatic take on the Freshly Made Sketch#105 here. Make a Cake and Teeny Tiny Wishes are the stamp sets and I used some Brights Designer Series Paper Stack. This birthday card uses the MojoMonday Sketch#312 here. 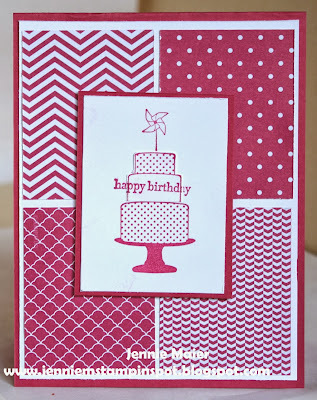 I also used the Create a Cupcake and coordinating Cupcake Builder punch with some Etcetera DSP. Here's the other card I promised that uses the Splitcoast Sketch#454. 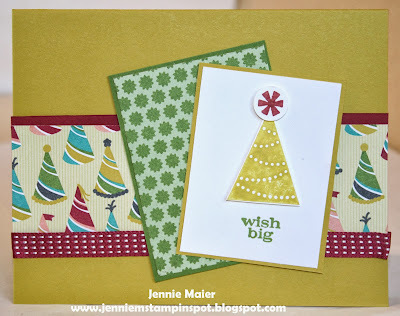 For this one I used the Color Me Christmas stamp set with some Season of Style DSP Stack. 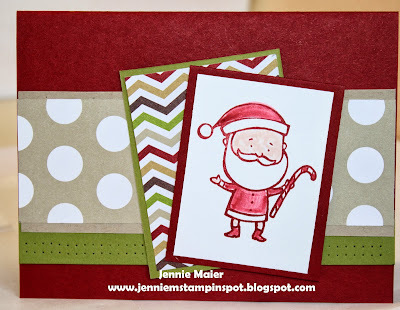 I colored in Santa with Cherry Cobbler and some blender pens and used the Paper-piercing pack and tool to add some dimension to the Old Olive piece of card stock. See what mileage you can get from a sketch just by changing stamp sets and papers! FINALLY some stamping time! And that's great cuz I need to make a dozen birthday cards for Home & School. I used the Splitcoast Sketch#454 here. 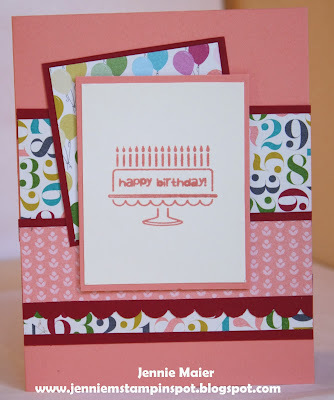 I used the Pennant Parade stamp set with some Birthday Basics DSP. Stay tuned for another card using this sketch, just different DSP and stamp sets tomorrow! Here's a quick card using the MojoMonday Sketch#310 and the PPA#171. The PPA was a color challenge to use Baked Brown Sugar, Calypso Coral and Very Vanilla. 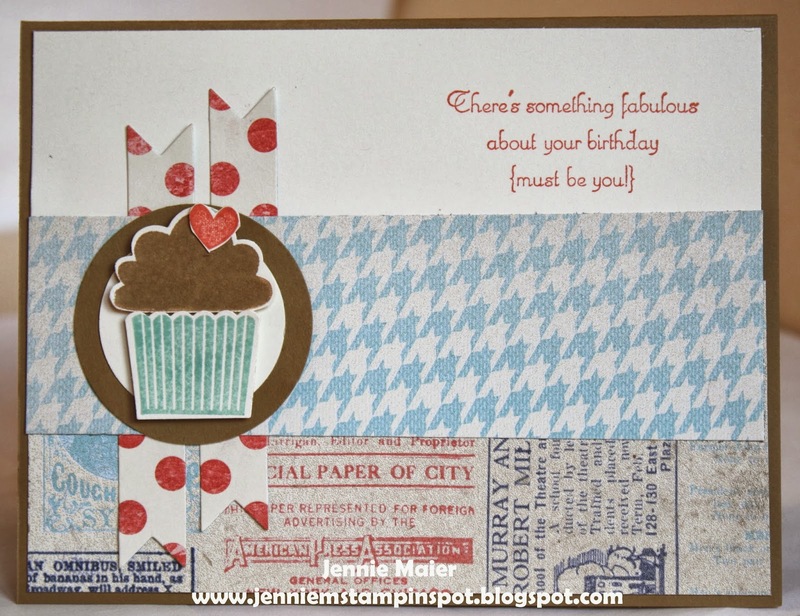 Delightful Dozen is the stamp set with some Etcetera DSP. Finally some time to stamp! 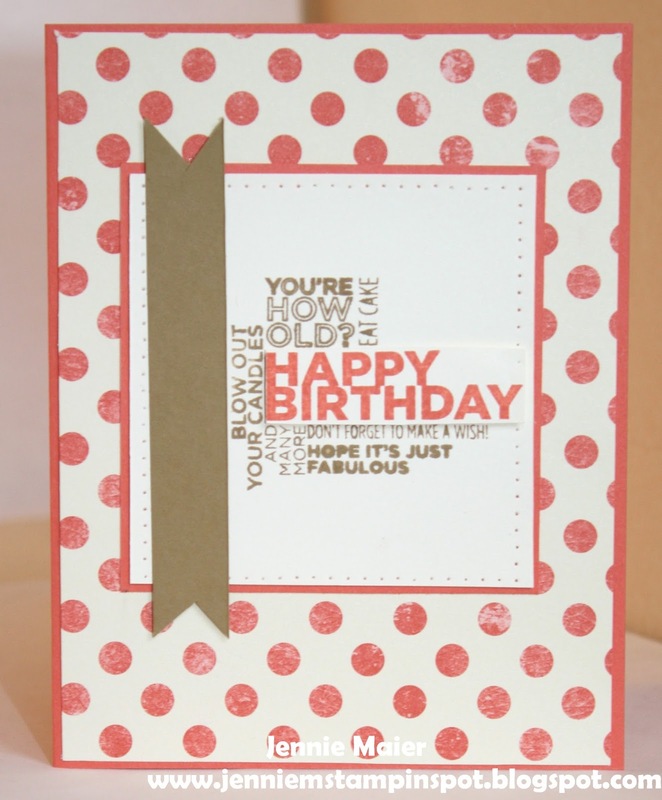 I need to make birthday cards so I used the Freshly Made Sketch#103 here. I paired that with the Embellished Events and Banner Greetings stamp set and some Birthday Basics DSP. This card came together super fast thanks to the Fab Friday Sketch#25 here. Four Frames and Petite Pairs are the stamp sets with some Modern Medley DSP. This birthday card uses the Freshly Made Sketch#101 here. 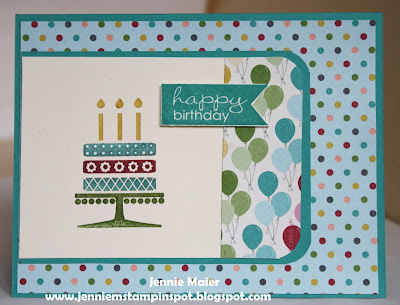 The stamp sets are Make a Cake and Teeny Tiny Wishes with some Birthday Basics DSP.